Join the discussion on our forums! Come discuss Grimestreet Pawnbroker over in our dedicated Grimestreet Pawnbroker discussion topic. 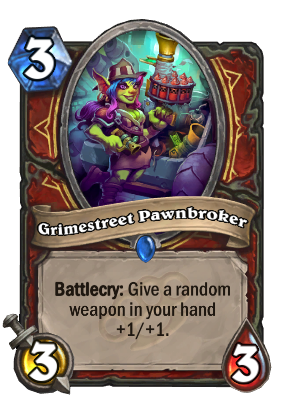 I enjoy running a Molten Blade in my wild pirate warrior deck, just for fun randomness, and now I'm running one Grimestreet Pawnbroker, after finding out that her buff is not lost as the weapon changes. I just won my last match because I pulled out a buffed 3/9 Doomhammer and played Heroic Strike. Instant 14 damage to face. after trying out the card, it was not good enough, but I can consider maybe 1 copy in the pirate list. I had 2 of these in my hand without any weapon. Fiery War Axe is almost always used on turn 2 though, thus not realy allowing play on curve, so it's unlikely this card will be all too great outside face-weapon decks. So Brann and this will make Gorehowl 9/3? New hottest goblin in Hearthstone. Sorry Kezan Mystic, but you spent a good two years at the top. ...what? Don't look at me like that! I am loving this for my Infinite Weapons Warrior! Actually not bad. Usable. Especially for pirate warrior. In that deck, so many weapons, probably gets value. In other decks, probably it'll be filler. This will be a great card to discover from Jeweled Scarab and the like. Good point. Perhaps there is a reason?